Easily Add Clickable Images (1920 x 442px), Embed Videos and add CTAs Here! Reorder slides or change them out in minutes. Blog marketing can be a powerful tool in your arsenal. Why should blog marketing be at the top of your internet marketing solutions task list? If it could be a one word answer, that word would be "traffic". However, as you will see in this free blog marketing how to guide, that when done successfully, it will increase blog traffic, overall site traffic, inbound links and your social media following. Those are a lot of accomplishments through just one strategy of blog marketing. This free, guide will be your ultimate resource for developing a successful blog marketing strategy. Blogging alone supplies your website with fresh, focused content on a regular basis. Blog marketing also gives you the chance to attract links from other websites that point to yours. This is a must for long-term success. The key to achieving more blog traffic and inbound links will be the quality of your content. How to find and secure good content for your blog marketing. How to optimize your posts for search engines and target markets. How to promote your blog content through social media & other sources. How to measure the effectiveness of your blog marketing. 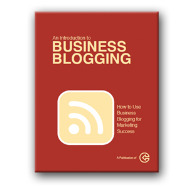 What are blog marketing best practices for business. Grab your free copy of better business blog marketing on the right side of this page.